Above is a picture of what’s currently in front of me, Friday, September 30th at around quarter to 5. The wine is a Dutton-Goldfield Russian River Zinfandel, circa 2006. I uncorked it last night after arriving home from an 85.5 km ride at 28.6 average km/hr (statistics courtesy of Strava) on my Formigli custom made road bicycle, but, feeling slightly gassed, corked it back up with the idea that I’d drink it later (today). Next to it sits a Leica IIIg with incredibly cool Carl Zeiss Jena 5.cm f1.5. It sits on a book I’m currently reading, and enjoying – Frederic Gros’ A Philosophy of Walking. Next to me, snuggled up against me, is Buddy, a curious looking hound I rescued from the local APCSA a few years ago, who just happened to become my best friend. Lucky me. The IIIg has no reason to be here except that I’m just enjoying its company. While it’s loaded with a 36 exposure roll of HP5 (after of course, snipping the film leader just so to make sure it’s loaded properly), I don’t anticipate I’ll be using in in any capacity. I’m just admiring it. I brought it out here just to look at it while I enjoyed my Zinfandel. What’s the point of this? Who knows. This entry was posted in Leica IIIg, Philosophy of Photography and tagged Carl Zeiss Jena 5cm 1.5 Sonnar, Leica IIIf on September 30, 2016 by Leicaphila. Distances and speeds seem more impressive- at first glance- in Km, than in miles? Km’s. I’m in training for a 1000Km 1 week ride through France next Summer with a friend. The friend has a serious “motor” as we say. I’m committed to being competitive. Lovely to be able to empathise. ….and in front of me, among the books and papers I study for my work, my M4 Black Paint. She has no reason to be here. My Canon 6D is in a soft padded bag, inside a closet, along with some monstrous lenses. But the – still – glossy black M4 is here, staring at me. What’s the point of this? We all know. We share very similar interests! I built my own bike from a 1980’s Raleigh Randonneur frame, built my own wheels fitted all the geartrain. Something so rewarding about putting together a piece of equipment that releases you on to the countryside! The Zinfandel is a lovely grape and pne that might accompany a good steak rather than a Leica. Were I not in deepest Africa (well, Northern Sierra Leone) on work I would be reaching out to my local vintners for a bottle right about now. This post and the picture of a bearded man smoking a cigar has made me miss the comforts that I fear will never be forthcoming from my grab bag. There never is a point; there’s always only a self-deception, tiny or great. And that’s life, and you have to make the most of the moment. Sometimes I withdraw the F3 from the safe and look at it, frame something, anything, through its real pentaprism and sight for what’s redundant. Then I put it back until the next time. Maybe that’s the point after all: repetition until nothing. My Leica and their assorted lenses (including a 1937 Sonnar) are sitting in my camera cabinet. My Canon 5D3 with its very plastic and boring 100mm f/2.8 Macro with its faux-impressive red ring, is on my desk next to my laptop. The reason? I was just out with it in the yard photographing some olives that just magically appeared on a tree. I wish my Leica gear was suited to such things, but alas the Canon and its auto-focusing macro lens are vastly superior tools when it comes to taking large pictures of tiny things. Not just of tiny things, but of anything where you have to make full use of what you can frame. That single requirement was why I never bought a rangefinder camera of any marque during my professional life: couldn’t afford to lose real estate to guesses. Look at HC-B or any other well-known exponent of the type: unless the subject is cropped or left visibly within a small part of the frame, you will see chopped off feet or some other shape-disaster due to lack of vision by masked corners or uncertainty. Retired, it could be fun to use, but with age comes a certain sloth, and though I still have an excellent scanner, once I had scanned all the stuff I wanted for the website, I stopped tormenting myself with all that spotting and mending of the marks of the decades. Yet, an M of some type feels as if it’s a required part of every photographer’s life. Given in a gift I’d use it and put up with the scanning, but I am not about to self-inflict! It is just a different tool. If I look back at all of the photographs I’ve taken in the last five years, probably 2/3 were taken with a Leica, which is a lot considering I’ve only owned a Leica for three years. For most casual shots I tend to crop very slightly in post, not because the M isn’t accurate enough, but because I rarely use a tripod and tend to have a more casual shooting style. I crop many of my SLR images too, just slightly, to get it just right for print. 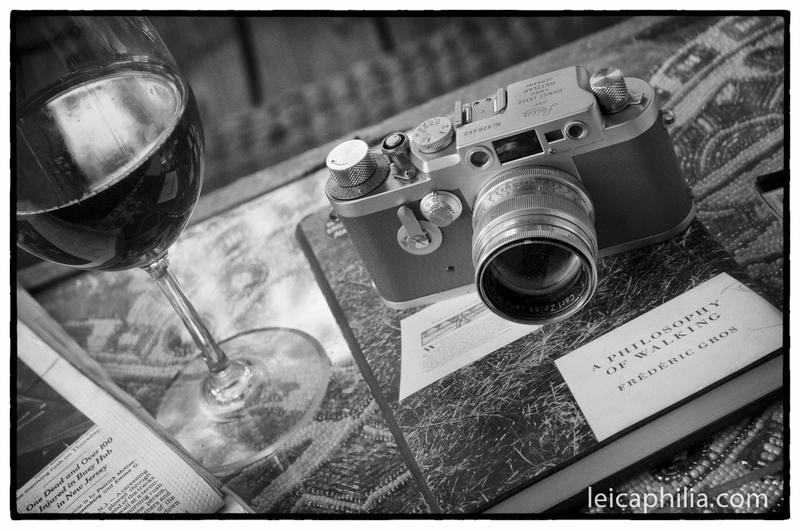 I prefer the Leica for shooting people. I like to see them with unlimited depth of field, which is exactly the opposite of how I like to see many objects where I try to focus on a specific element. I prefer the Leica for wandering in the city, and the Canon for capturing nature. Different tools, simple as that. A pleasure to read. Thanks. “The IIIg has no reason to be here except that I’m just enjoying its company”. This captures my own feeling nicely. The camera is part of the experience in photography. Shared experience is one of the best feelings a person can have. That can apply to a device when the collaboration is productive. You nailed it. “I’m just enjoying its company”. Yes, and a strange thing: I have never felt that way about a digital camera. When I was working, my cameras were almost never used for anything but work. But the emotional attachment was so strong, especially towards my original F and then the 500C. Retired, I still shoot a lot, but totally for myself; photography has become a form of therapy that bore me through the death of my wife and filled the void that she let behind her. I now owe it not a living, but possibly my life. And that second stage has all been digital, but despite photography’s new significance to me, there is no attachment to the cameras, but there is to one lens: the 500 mirror. I use it very seldom because I hate carrying a tripod and I can’t even frame with that lens without a tripod. Yet, looking through it, focussing, it’s magical. So yeah, it’s an emotional buzz, but that’s it: one lens but no current body holds sentiment! I hope you will reach your aim. Parce que la France, ce n’est pas plat du tout; il y a “quelques” collines et même des sacré montagnes…. dépend où tu vas te balader, mais de toute façon, c’est sportif! J’espère d’entendre quelque chose next year. And of course with some nice shots!